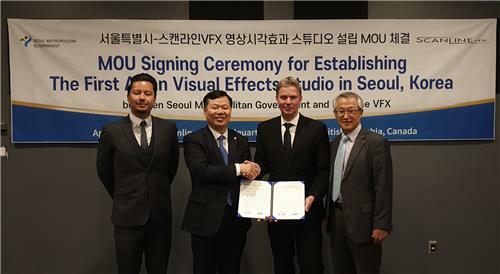 (SEOUL=Yonhap News) Scanline VFX, a special effects company involved in a wide range of Hollywood movies, including Captain Marvel and Aquaman, is opening a studio at the DMC Business-University Collaboration Research Center in Mapo in Seoul. According to the Seoul Metropolitan Government and the Korea Trade-Investment Promotion Agency (KOTRA) on April 14, they have succeeded in attracting four regional headquarters and R&D centers of North American companies including Scanline VFX. These companies will invest USD 110 million (KRW 125 billion) in Seoul over the next five years and create 550 new jobs. Scanline VFX has its studios around the world including Vancouver, Los Angeles, and Munich, and plans to invest USD 50 million (KRW 56.9 billion) this year to open its first Asian studio at the DMC Business-University Collaboration Research Center while creating more than 310 jobs for the next fiver years through 2023. Stephan Trojansky, Scanline VFX president, said "Seoul is an attractive investment destination and source of great talent," adding that "the support plan laid out by the Seoul city government, the Korean government, and KOTRA's Vancouver office has been influential in making investment decision." Platinum21 Capital, a biotech company specializing in medical diagnostics, plans to set up a regional office in Seoul and make investment worth USD 53 million (KRW 60.3 billion) while hiring 200 people for the next five years. Finhaven, a Vancouver-based Fintech company, is opening an R&D center in Seoul with a plan to hire 30 or so employees and invest USD 10 million (KRW 11.4 billion). BuildBlock, a Silicon Valley blockchain startup, plans to invest USD 1 million (KRW 1.2 billion) in establishing a regional office and hire 10 or so employees.